In order to continue with Part 2, I felt that a few more photos were required. So, I spent the better part of Saturday evening going through Mother's old desk. I don't think she threw away a piece of paper since she came here in 1946. Definately a treasure trove. As you can imagine it was a trip down memory lane for me. One of the first discoveries was my New Brunswick Guides certificate issued in 1952. A short dig below that turned up Fathers guides certificate dated 1935. But I digress. So back to fishing. is to get ahead it it and turn it around so that the short leg is on the downhill side. Porcupines eggs do not require an explanation. At times, Father's expressions could be quite coarse...I will give the following example::: A huge trout was referred to as a "old sodamite" or a"leggamac%&*t". Most often used to describe the one that got away. 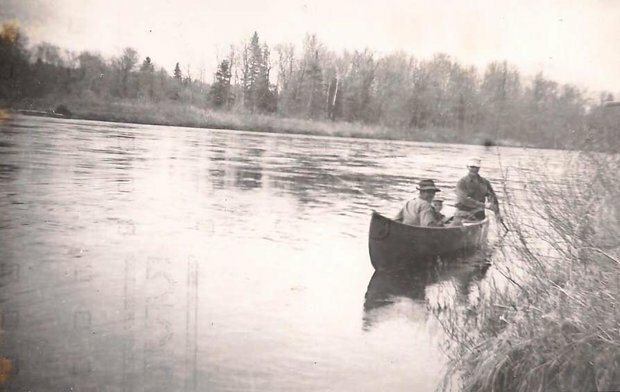 During the 60's Father's main fishing goal was to locate an area that was rarely fished and contained reasonably large trout.He finally settled on the Crooked deadwater portion of the Tuadook River. This was an all day walk one way.By the time you got there you had just enough time to prepare a lean to and gather wood for the fire. When that was complete one had maybe an hour of fishing. Any trout caught then were consumed for supper. The next day was spent fishing and exploring..The third daywas a long return walk to the vehicle. One did not carry many large trout from there.It doesn't take many 16-24 inch trout to become more weight than one wanted to carry all day. 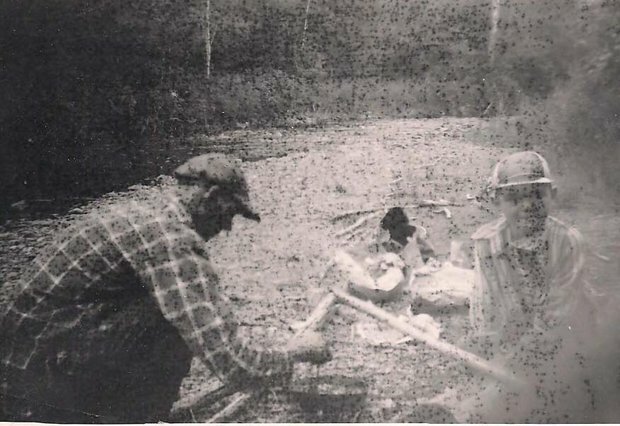 Father's fishing buddy on most of the sadistic excursions was a neighbour farmer James D. These Crooked deadwater trips were done once a year..Generally around Father's birthday in the third week of June. These trips were not only great fishing but also supplied me with bits of recent history. 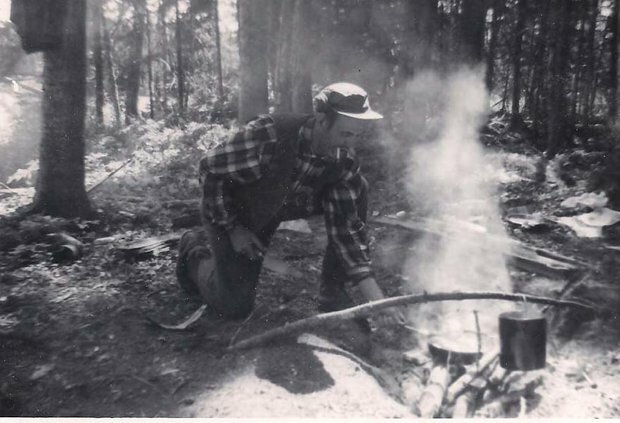 In the late 1800's and early 1900's the Olgivy family had a series of moose hunting camps. One of these was located at the head of the Crooked deadwater. When I first saw the area two walls and a portion of the roof were still intact. It was the roof that intrigued me the most. Ridge poles, a layer of hand split boards, a layer of mud More small poles covered in boards, a layer of birch bark and topped with a layer of hand split cedar shakes.A lot of work but insulated and waterproof at the same time. At the lower end of the deadwater was an old driving dam...Beside the dam was an old small log cabin. The roof had a large hole and was rapidly going to the ground. Additionally, several generations of purcupines had called the place home. What came to attention was the names and dates on the walls. No famous names, but the most recent date was 1923.
and the pack basket were the only high groung left for the ants. It was very disconcerting to have to wait untill an ant climbed the length of me and surface at my shirt collar. Even worse was seeing trout in the 2-3 pound range picking off ants as they floated free of the raft. We had about 10 years of fishing that area before it was discovered by other fishermen. At the same time a large lumber company decide the area was ready for harvesting. Hence a lot of roads and now a 3 minute walk to the fishing hole. Once the area became reachable Father never went back. 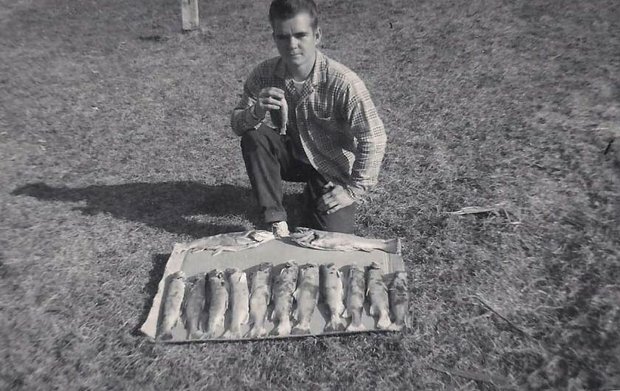 One of the last trout excursions that I went with Father and James D. was to a fair sized lake. It was a fair step to the lake, but we arrived there shortly after noon. The lean to was set up and firewood gathered. While gathering the wood we discovered an old aluminum canoe hidden under some brush. As we started to paddle around the lake we spotted a sign post on an old beaver house. The sign said "ptivate lake..no fishing". Apparently the lake was on International Pulp and Paper territory. Father then laid the sign face down on the beaver house an asked us if we saw any no fishing sign. The response was a unanimous "No". After a leisurely afternoon fishing we returned to the camping site only to find that a visiting bear had ransacked the pack baskets and eaten nearly all the grub. Somehow the bruin missed one loaf of bread, a jug of margarine and one small can of boneless chicken. After a trout supper Father and James went back on the lake with the canoe. I fished from shore a bit and then laid down and fell asleep. Father woke me a few hours later, He was not pleased. It was dark when they returned and I had let the fire out. It was next to impossible for them to locate the campsite, Father had came ashore and walked a fair distance in order to locate camp. Needless to say the meals the next day were all trout, trout, and more trout. 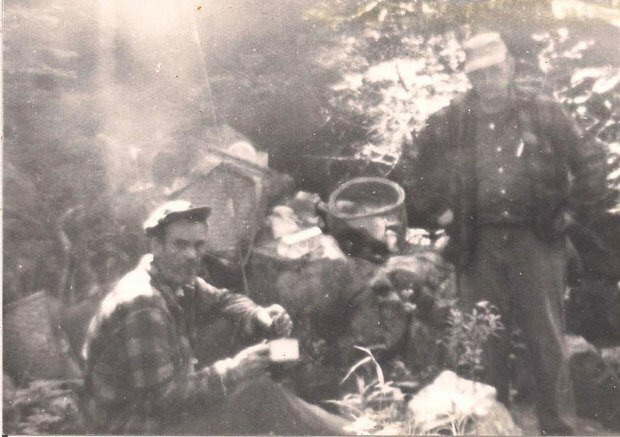 On the way back on the third day Father stopped in the middle of a swamp and cooked another pan of trout. I am sure he was not hungry and did it just to torture me.